For the California wine region, see North Yuba AVA. Yuba County is a county in the U.S. state of California. As of the 2010 U.S. Census, the population was 72,155. The county seat is Marysville. Yuba County is included in the Yuba City, California Metropolitan Statistical Area, which is also included in the Sacramento– Roseville, California Combined Statistical Area. The county is located in the state's Central Valley region along the Feather River. 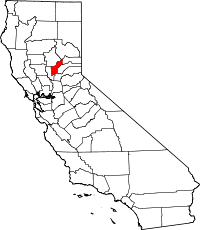 Yuba County was one of the original counties of California, formed in 1850 at the time of statehood. Parts of the county's territory were given to Placer County in 1851, to Nevada County in 1851 and to Sierra County in 1852. The county was named after the Yuba River by Captain John Sutter for the Maidu village Yubu, Yupu or Juba near the confluence of the Yuba and Feather rivers. General Mariano Vallejo stated that the river was named Uba by an exploring expedition in 1824 because of the quantities of wild grapes (uvas silvestres in Spanish) which they found growing on its banks. According to the U.S. Census Bureau, the county has a total area of 644 square miles (1,670 km2), of which 632 square miles (1,640 km2) is land and 12 square miles (31 km2) (1.9%) is water. It is the fifth-smallest county in California by total area. The county lies along the western slope of the Sierra Nevada, the steep slopes making it prime territory for the siting of hydroelectric power plants. National protected areas within Yuba County include portions of the Plumas National Forest and the Tahoe National Forest. In addition to these identified protected areas the county has extensive natural areas consisting of forestation, grassland, riparian area, grassland and other habitats. Yuba is a strongly Republican county in Presidential and congressional elections. The last Democratic presidential candidate to win a majority in the county was Jimmy Carter in 1976. Yuba Sutter Transit operates local bus service, as well as commuter runs to Downtown Sacramento. Greyhound buses stop in Marysville. Yuba County Airport is located three miles (5 km) south of Marysville. It is a general aviation airport. As of the census  of 2000, there were 60,219 people, 20,535 households, and 14,805 families residing in the county. The population density was 96 people per square mile (37/km²). There were 22,636 housing units at an average density of 36 per square mile (14/km²). The racial makeup of the county was 70.6% White, 3.2% Black or African American, 2.6% Native American, 7.5% Asian, 0.2% Pacific Islander, 10.0% from other races, and 5.9% from two or more races. 17.4% of the population were Hispanic or Latino of any race. 11.2% were of German, 10.4% American, 7.6% Irish and 7.5% English ancestry according to Census 2000. 78.8% spoke English, 13.2% Spanish and 4.7% Hmong as their first language. There were 20,535 households out of which 38.1% had children under the age of 18 living with them, 53.2% were married couples living together, 13.3% had a female householder with no husband present, and 27.9% were non-families. 21.7% of all households were made up of individuals and 8.2% had someone living alone who was 65 years of age or older. The average household size was 2.87 and the average family size was 3.34. The median income for a household in the county was $30,460, and the median income for a family was $34,103. Males had a median income of $27,845 versus $21,301 for females. The per capita income for the county was $14,124. About 16.3% of families and 20.8% of the population were below the poverty line, including 27.6% of those under age 18 and 7.8% of those age 65 or over. ^ "Yuba County High Point". Peakbagger.com. Retrieved March 30, 2015. ^ "California State - Expulsion, Suspension, and Truancy Information for 2009-10". Retrieved June 25, 2011. Caroline M. Olney (December 1902). "Mountains and Valleys of Yuba County". XL (6): 567–588. Wikimedia Commons has media related to Yuba County, California.